Home > Guides > How to Pay Income Tax Online? Income tax website of government. Any Bank’s website that provides Online Income tax payment facility for e.g. HDFC online tax payment and SBI Online payment portal. Also, paying taxes online through a bank website requires you to have an account with that bank. Step 1 : Visit the website, https://onlineservices.tin.egov-nsdl.com/etaxnew/tdsnontds.jsp. 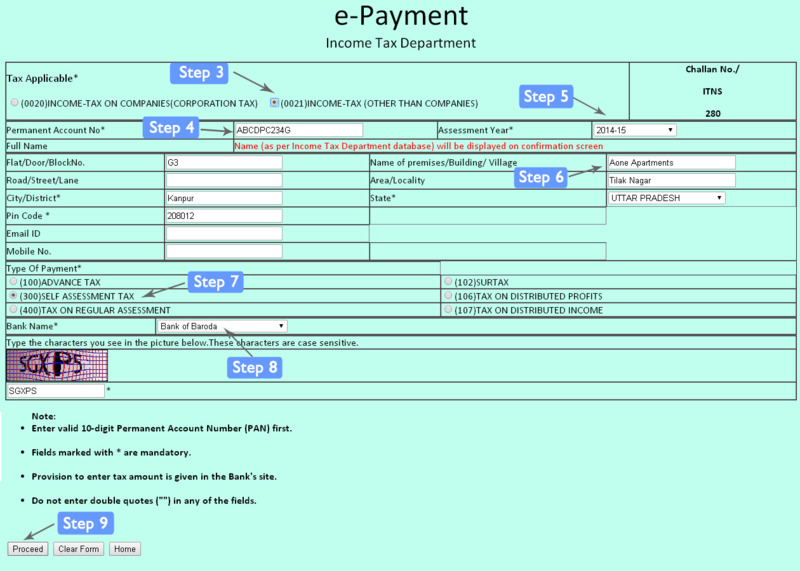 The e-Payment page of Income Tax Department is displayed. All the fields marked with * are mandatory. 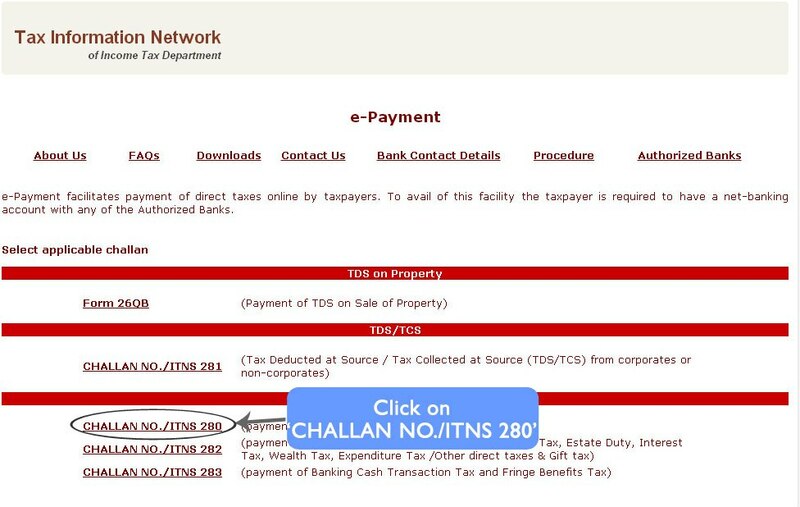 Step 2 : Under Non-TDS/TCS, click 'CHALLAN NO. / ITNS 280' as shown in the figure below. Step 3 : In the resultant form, if you are an individual paying your income tax, select '(0021) Income-Tax (Other than companies)' (refer figure shown below). Step 4 : Enter your correct Permanent Account Number. Step 5 : Read the meaning of Assessment Year and choose the correct Assessment Year. If you are paying income tax on the income earned during 2013-14, select the Assessment Year as 2014-15. Step 6 : Enter your Address details (refer figure shown below). Step 7 : From Type of Payment, select '(300) Self-Assessment Tax' if you are paying your Income Tax due which is determined during the preparation of your Income Tax Return (refer figure shown below). Step 8 : Select the bank name through which you want to make the payment. Step 9 : Click Proceed. On the next screen you will be shown all the details that you entered in previous steps, make sure that all the details are correct. Step 10 : If your name, PAN, and other details are correctly displayed, click 'Submit to the Bank' (as shown in the figure above) and proceed further.If you want to make any changes, click 'Edit'. Step 11 : You will be redirected to the bank’s payment gateway whereyou will be asked about the amount of income tax paid.After successful payment of income tax, an online Challan/confirmation will be generated. 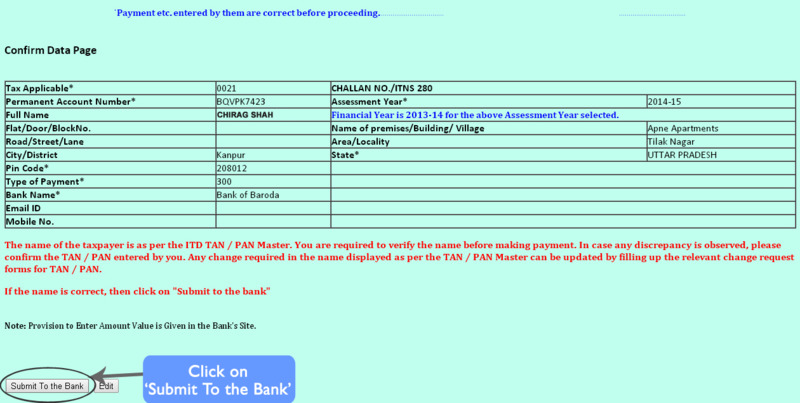 Step 12 : Save the copy of Challan and note BSR Code, Amount of Income Tax, Challan No. and Challan Date. You will require these details during efiling of Income Tax return. This completes your whole process of paying income tax online. What is the meaning of Assessment Year? Assessment Year is the year which immediately follows the Financial Year. Before proceeding for payment, confirm the assessment year for which you are paying the taxes. If your assessment year is incorrect, you may encounter trouble and you might not get credit of Income taxes paid. Financial Year refers to the period in which the income is earned. Assessment year is the year immediately following the financial year wherein the income of the Financial Year is assessed. Assessment year is the year in which the income tax return is filed and therefore it is the year next to the financial year. If you earn Rs. 5 Lakhs per annum from April 1, 2013 to March 31, 2014, then it implies that Rs. 5 Lakhs was earned during the financial year, 2013-14. The Income tax return will be filed in the next year and therefore the assessment year will be 2014-15. Hence, financial year 2013-14 and assessment year, 2104-15 means the same thing. If you wish to pay income tax on the income earned during the financial year 2013-14, you need to specify it as Assessment Year, 2014-15. What is Advance Tax and Self Assessment Tax? It is the tax paid by an individual in advance i.e. before the end of the financial year for which the income is earned. It refers to the Income tax dues paid after the end of the financial year and are calculated and paid at the time of filing of income tax return. If an individual A earns Rs. 10 Lakhs per annum as salary during the financial year, 2013-14, the individual is required to pay advance tax (on fulfillment of certain conditions) before March 31, 2014 (end of financial year). Suppose, while filing the return in July 2014, the individual determines that more amount of tax is to be paid, the extra tax will be called as Self Assessment Tax. After successful payment of income tax online you can e-file income tax return in a simple and quick way with our easy step-by-step process.